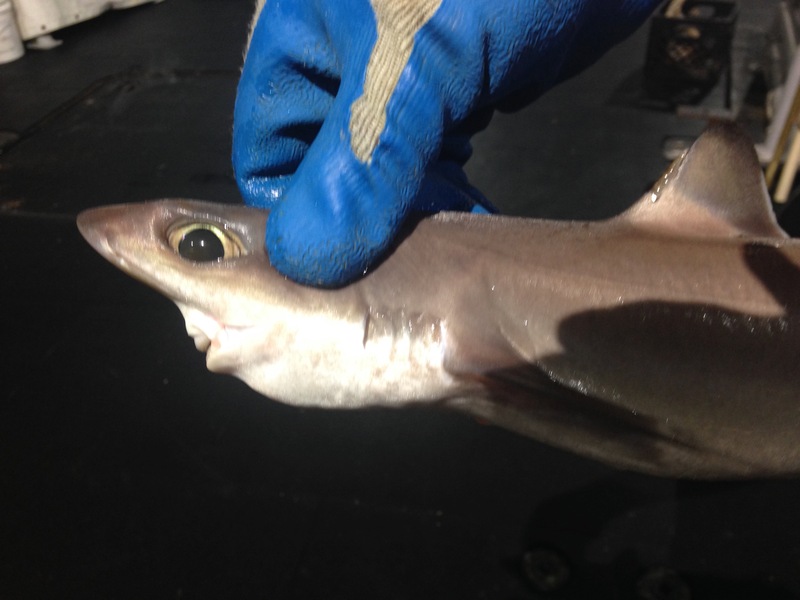 Well, I’m back on dry land, with lots of great memories of sharks, big and small, and all the interesting people who I spent two weeks with on the Oregon II. And let’s not forget the red snappers either. On our last day, we fished at a couple of sites right off the coast of Alabama and caught lots of sharks, plus a new species of grouper for the trip. 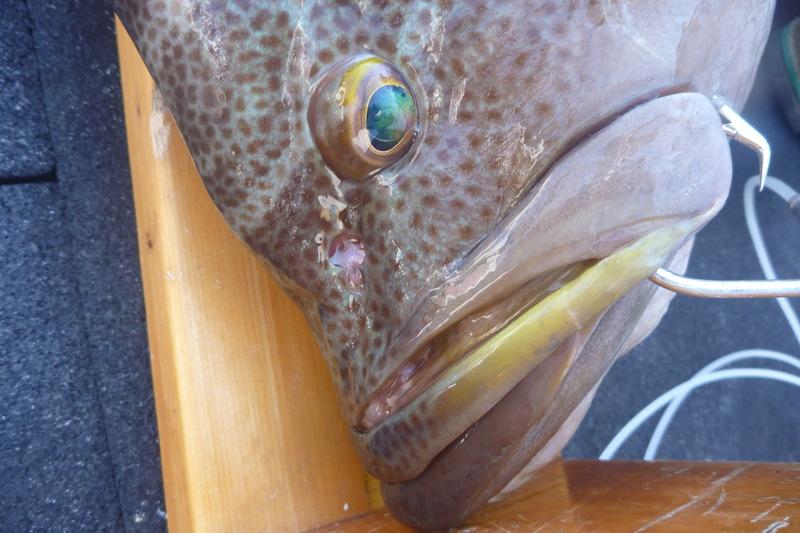 The scamp grouper (Mycteroperca phenax) is apparently not frequently found on the longlines along the coast of Texas but becomes more common along the coasts of Mississippi and Alabama and up the Eastern Atlantic coast as well. The groupers are mostly protogynous, meaning that when they become sexually mature, they are always females. Only later in life, when they have grown bigger (and have the right environmental influences), do they transition to males. This species can live for more than 30 years, but that’s actually relatively short for a lot of the grouper species, some of which can live to 60 years or more. Scamp grouper come together in groups to reproduce, so this makes them vulnerable to overfishing. The management councils take this into consideration when making a management plan and will close off areas known to be spawning grounds during the reproductive season. These are also great areas to target as Marine Protected Areas. All of this knowledge about the scamp grouper (and other species we encountered on this survey) was gained through careful scientific research. As mentioned before, the long line survey was started in 1995 and has been conducted using the same methods every year since then. 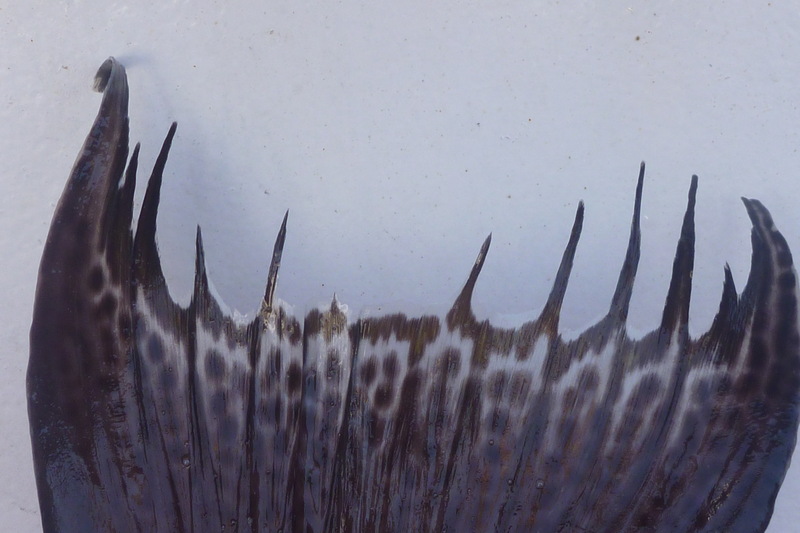 These data are used by fisheries managers to set catch limits and detect changes that might indicate problems for the species living in these areas. In other words, the science forms the basis for decision making and planning. This is true for the various surveys that NOAA conducts in the Gulf each year. The Groundfish Survey, for example, provides vital information about the extent of the Dead Zone off the coast of Louisiana, by measuring dissolved oxygen levels on the sea floor as part of the survey. This data tells us that we need to continue to work on controlling nutrient inputs into the Mississippi River from agriculture lands and cities that span much of the eastern United States. Scientific research also tells us that we need to be planning for and mitigating the effects of the looming problem of climate change. Climate change will certainly bring about significant change to the Gulf. As ocean temperatures rise, water becomes less dense and therefore takes up more space. Along with continued melting of land-supported ice in the polar regions, this is contributing to a cumulative increase in sea level of 3.2 mm per year (https://oceanservice.noaa.gov/facts/sealevel.html). In the Gulf, this increase will particularly impact estuarine ecosystems that are rich nurseries for many fish species and are extremely productive habitats. One of the predictions of many climate models is that increased global temperatures are likely to bring about more frequent and more intense hurricanes. This 2017 hurricane season is a stark reminder of the devastating impacts that hurricanes can have, even when we have the scientific tools to predict approximately where and when the storm will make landfall. Finally, the increase in global temperatures will make the regions surrounding the Gulf less pleasant places for people to live. The summers are already very hot and humid, and a degree or two hotter will make a lot of difference in the livability of the region. We know all of this through careful scientific research, and there is a consensus amongst scientists that this is happening. To prepare for the effects of climate change and to know how to best minimize those effects, we must continue to collect data and do science. After all, what is the point of scientific research if we don’t use the results to make better choices and to address the problems that are facing us? Personal Log: I am so grateful for the opportunity to go on this research survey and for the Teacher at Sea program as a whole. I strongly encourage any teacher thinking of applying to the program to do so. Thanks to NOAA and everyone at the TAS office for all your help and support. 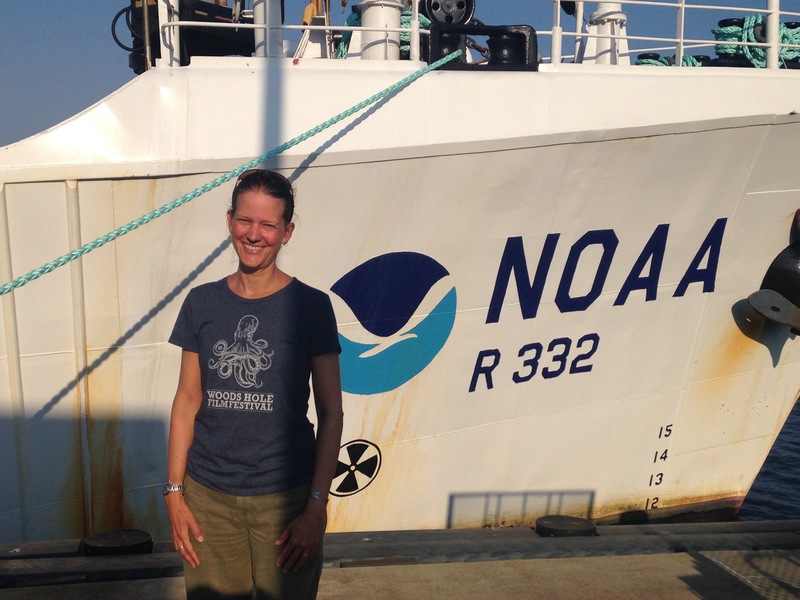 This entry was posted in 2017, Katherine Schafer, NOAA Teacher at Sea and tagged grouper, Gulf of Mexico, longline survey, NOAA Ship Oregon II, sea level rise, shark. Bookmark the permalink.